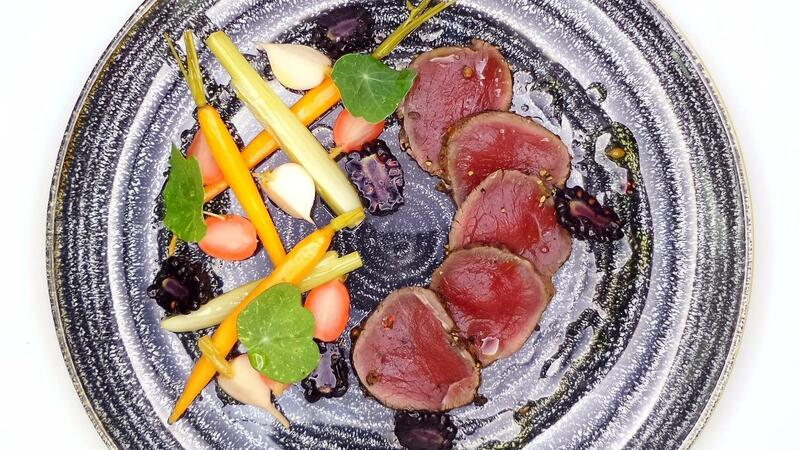 This cured venison dish is a perfect autumnal starter showcasing wild venison served with delicately pickled vegetables. Bring to the boil and whisk to ensure everything is incorporated. Remove from heat and allow to cool before immersing the venison in the brine for 24 hours. Remove the venison from the brine and dry with a kitchen towel. In a food processor, blend the caster sugar, salt, star anise, all spice, whole peppercorns, thyme and bay leaf marinade together. Add the shallots, KNORR Garlic Puree, orange zest and blend until a rough paste is formed. Rub the marinade onto the venison and place into an appropriate size container and push cling film down on top to seal then leave overnight in the fridge. Rub and gently wash the marinade off the venison then dry with kitchen paper. Set aside. In a pestle and mortar grind the black peppercorns and pink peppercorns and place on a tray. Heat the rapeseed oil in frying pan and seal the pieces of venison all over for 1-2 min. Brush the venison with COLMAN'S Mustard and roll the venison in the ground peppercorns and wrap tightly in cling film and chill until required. Peal the baby carrots, cut the baby fennel in half and quarter the radishes and baby turnips. Place the vegetables into a large bowl and mix with the salt. Allow the salt to draw the moisture from the vegetables for 1 hour. Wash the excess salt off the vegetables and dry. Place the salted vegetables in a small deep tray and set aside. Bring all the other ingredients to the boil and pour over the vegetables, cover and allow to cool. Cut the blackberries in halves and set aside. Slice 5 thin slices from the cured chilled cured venison loin and arrange on a cold plate. Remove the vegetables from the pickling liquor and arrange around the plate with the halved blackberries and nasturtium leaves. Drizzle some of the pickling liquor over the dish and serve.